Last year, the UN envoy had carved a path for a government "transition." But the White House and Hillary Clinton rejected it. Despite Secretary of State John Kerry’s frenetic efforts, preparations for the “Geneva II” peace conference on Syria’s civil war are already foundering. 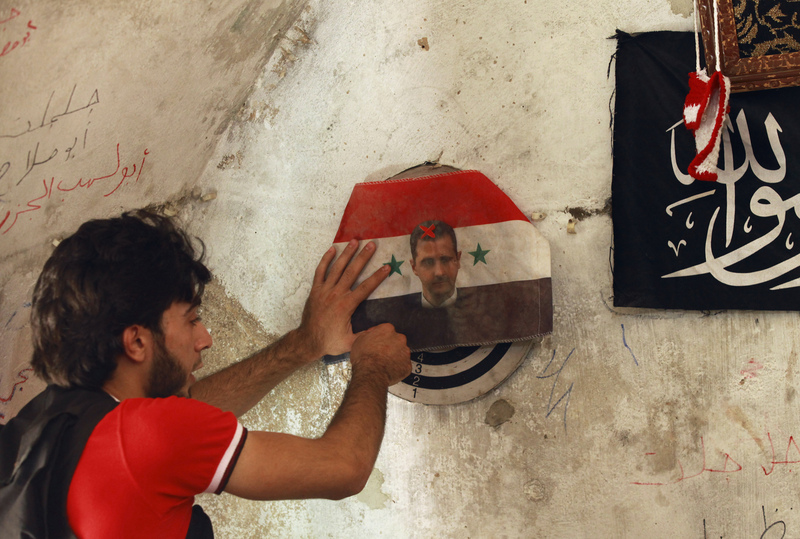 The rebel movement has become increasingly radicalized against Syrian dictator Bashar al-Assad and more fractured. A newly confident Assad, meanwhile, has somewhat relegitimized himself as a signatory to a new chemical-weapons ban negotiated by the United States and Russia under U.N. auspices, which his government is tasked with implementing over the next year. Defying global opprobrium over his use of sarin gas, Assad has also positioned himself in a series of high-profile TV interviews as a preferable alternative to Islamist rebels who want to create a fundamentalist state. All of which should prompt a reexamination of the first Geneva conference in the summer of 2012, on which Kerry’s new push for peace is based. According to some officials involved, perhaps the greatest tragedy of Syria is that, some 80,000 lives ago, President Obama might have had within his grasp a workable plan to end the violence, one that is far less possible now. But amid the politics of the 2012 presidential election—when GOP nominee Mitt Romney regularly accused Obama of being “soft”—the administration did little to make it work and simply took a hard line against Assad, angering the special U.N. Syria envoy, Kofi Annan, and prompting the former U.N. secretary-general to quit, according to several officials involved. Former members of Annan’s negotiating team say that after then-Secretary of State Hillary Rodham Clinton and Russian Foreign Minister Sergei Lavrov on June 30, 2012, jointly signed a communique drafted by Annan, which called for a political “transition” in Syria, there was as much momentum for a deal then as Kerry achieved a year later on chemical weapons. Afterward, Annan flew from Geneva to Moscow and gained what he believed to be Russian President Vladimir Putin’s consent to begin to quietly push Assad out. But suddenly both the U.S. and Britain issued public calls for Assad’s ouster, and Annan felt blindsided. Immediately afterward, against his advice, then-U.N. Ambassador Susan Rice offered up a “Chapter 7” resolution opening the door to force against Assad, which Annan felt was premature. Annan resigned a month later. At the time, the soft-spoken Ghanaian diplomat was cagey about his reasons, appearing to blame all sides. “I did not receive all the support that the cause deserved,” Annan told reporters in Geneva. He also criticized what he called “finger-pointing and name-calling in the Security Council.” But former senior aides and U.N. officials say in private that Annan blamed the Obama administration in large part. “The U.S. couldn’t even stand by an agreement that the secretary of State had signed in Geneva,” said one former close Annan aide who would discuss the talks only on condition of anonymity. “He quit in frustration. I think it was clear that the White House was very worried about seeming to do a deal with the Russians and being soft on Putin during the campaign.” One of the biggest Republican criticisms of Obama at the time was that he had, in an embarrassing “open mike” moment, promised Moscow more “flexibility” on missile defense after the election. Administration officials deny this account, as do some who were involved at the State Department. Nonetheless, Frederic Hof, a U.S. ambassador who was Clinton’s special adviser for transition in Syria at the time, agrees that the negotiations could have been better handled. The harsh demand that “Assad must go” voiced by Clinton and British Foreign Secretary William Hague was “gratuitous,” says Hof, a senior fellow at the Atlantic Council. “Perhaps a greater effort should have been made to give Annan the time to do his due diligence.” Still, Hof says he saw no evidence that the administration was posturing for political reasons. A current senior State Department official concedes that one of the problems with making the Annan communique work may have been Clinton’s distaste for getting involved in extended direct mediation, in dramatic contrast to her successor, who has opened up negotiations on several fronts at once—with Syria and the Russians, with Iran, and between the Palestinians and Israelis. “We’ve made more trips to the Mideast in the last nine months than she made in four years,” says this official. But what happened next was that the Geneva communique disappeared onto a dusty shelf; even Kerry when he took office chided the Obama administration for being “late” in pushing peace. And what Kerry faces now is a newly assertive Assad and a vastly more fractured opposition riddled with extreme elements that want no part of a U.S.- or Western-brokered peace. All of which makes that missed opportunity even more painful.